Open Tracking is a way to know if the mails you’re sending are really read by recipients. For the trick to work FollowUp.cc adds special artifact to mail you’re about to send, and then tracks this artifact across the vast internet. 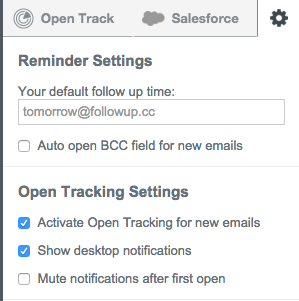 When does Open Tracking “Track” an Open? Tracking event is registered every time the tracking pixel has been loaded in the browser. This tracking pixel is in body of the message, so every message your text has been cited in, is treated by our system as your original message. – If you sent mail to one person, you are sure that first open was caused by him/her. – Recipient could go back and forth with other emails on the thread, about your email (and your message is cited there for all the time), in that case counter could register many opens. How to use Open Tracking? Once you have Open Tracking working, you can view the tracking updates on the side panel. Q: I have send a few messages, but I am not seeing any open tracking date.Why? 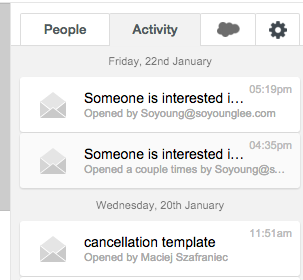 Usually then a user finds that open tracking is not working, it is because the email is being sent to yourself. Open Tracking will not alert you when you open your own email. The system works this way for several reasons, but primarily because it would give you alerts every time you opened an email thread that was tracked and that would be annoying. Q: I know my message was read, but I was never notified that it was opened? Open tracking is more of an indicator than an absolute. The system can not track every email when a user opens it, on occasion a user may be blocking tracking technology or have an email system set up in a way that does not allow us to track. This is a limitation of any open tracking system. If you check your email from anything where FollowUp is not logged in, it will count as a view from a tracking standpoint. There is no way for us to confirm you as a user with FollowUp which is why the tracking software shows an additional opened email. Q: Can I see how many times my tracked email has been opened? Yes! If you have the extension installed in Google Chrome you can see it in your panel located on the right within gmail. Link Click Tracking is a way to know if the links you include in your emails are truly being clicked by the recipients. We track this by replacing the link you are sending with a link of our own. When our link is clicked, it pings you to tell you it was clicked, while re-directing them to your original link. It’s that simple. What does Link Click Tracking look like, and where do I verify a click occurred? As you can see in the picture below, just like Open Tracking, Link Click Tracking shows up in your Activity feed found in your Side Bar within Gmail. Please note that this feature is available only through Chrome Extension and only works with Open Tracking also selected. Q: Can I track just link clicks on an email I send? For Link Click Tracking to work you must have Open Tracking selected for the checkbox for Link Click Tracking to be selectable. Link Click Tracking is a new feature. As we discover more common trouble shooting mistakes we will add them periodically.